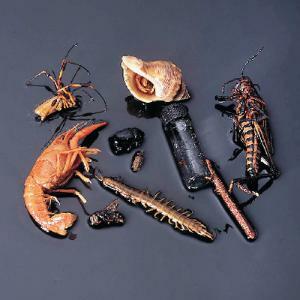 Five classes of arthropods are represented in this set: Crustacea, Arachnida, Chilopoda, Diplopoda, and Insecta. Contents: sow bug (Oniscus), hermit crab (Pagurus), crayfish (Cambarus), spider (Argiope or similar), tick (Dermacentor), centipede (Scolopendra), millipede (Julus), grasshopper (Romalea), beetle (species vary), and bee (Apis). The set of ten is supplied in separate, labeled jars.